Peek-a-Boo Nursery Markinch are currently looking to recruit a playfriend (support worker). Duties: The successful candidate would work collaboratively with the child’s keyworker and other staff members to observe, plan and provide for the child’s interests and development. They will be expected to assist the child to take part as fully as possible in the activities offered and help the group identify any adaptations needed. They will be expected to develop good relationships with the child’s parents/carers and other agencies and to liaise closely with them. They should be aware of any medical/physical difficulties and be able to deal with them appropriately. They should encourage the child to be as independent as possible whilst providing appropriate support to facilitate development and learning. Qualifications: Applicants must be able to register with the SSSC as a Practitioner or Support Worker and be qualified to/or working towards S/NVQ Level 3 Childcare and Education/SCQF7 Children and Young People or equivalent (see SSSC website for details of qualifications). Before confirming an appointment for this vacancy, the successful candidate is required to obtain Protection of Vulnerable Group (PVG) membership through Disclosure Scotland. 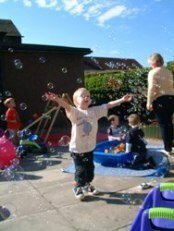 Bright Starts Day Nursery are currently looking to recruit a playfriend (support worker) for two children. These hours are negotiable within the children’s attendance pattern. Contract: Due to funding source changing to Fife Council in August 2018, this post is temporary until June 2018, however if funding is continued the post would be reviewed and extended.